The Plaza de Armas (main square) was the centre of Inca Cusco and, still today, remains at the heart of modern Cusco. 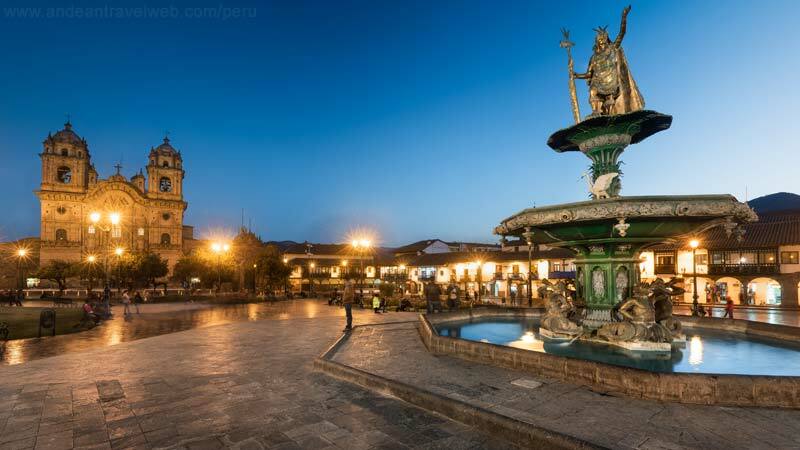 During Inca times the Plaza was known as Huacaypata (the Place of Tears or the Weeping Square) and was a place of ceremonies and military parades. It has been said that when the Inca's conquered new lands they would bring back some of the soil to be mixed with the soil of Huacaypata, as a symbolic gesture to incorporate the newly gained territories into the Inca empire. The Plaza was once flanked with Inca palaces. The remains of the ancient walls of Inca Pachacutec's palace can still be seen on the north-west side of the square (inside the Roma Restaurant close to the corner of the Plaza and Calle Plateros. The northern and western sides of the Plaza are now lined by arcades with shops and travel agencies. There are many restaurants, bars and coffee shops with beautifully carved wooden balconies overlooking the Plaza - a great place to relax and enjoy the view. The Plaza's north-eastern edge is dominated by the Cathedral which is flanked on the right-hand side by the El Triunfo church. On the south-east side is the smaller but more ornate church of La Compania de Jesus with its impressive pair of belfries. The Cathedral dominates the north-east side of the Plaza de Armas and sits squarely on the foundations of the Inca Viracocha's palace. The Cathedral was begun in 1550 and completed nearly 100 years later, constructed in the shape of a Latin cross. The three-aisled nave is supported by only fourteen massive pillars. It contains nearly 400 colonial paintings including the Last Supper by Marcos Zapata showing Christ and the Apostles about to dine on guinea-pig, washed down with a glass of chicha! In the sacristy there's a painting of the crucifixion attributed to Van Dyke. Ten smaller chapels surround the nave, with the Chapel of the Immaculate Conception, and the Chapel of El Señor de los Temblores (The Lord of Earthquakes) are worthy of special attention. The Cathedral's real magic lies in the mingling of history and legend. It is said that when the Cathedral was built an Inca prince was walled up in one of the towers and that when the tower falls the Inca will emerge to claim his birthright and free his people. After the earthquake of 1950 thousands of believers waited hopefully for the tower to collapse, but despite severe damage, they did not and were later repaired. 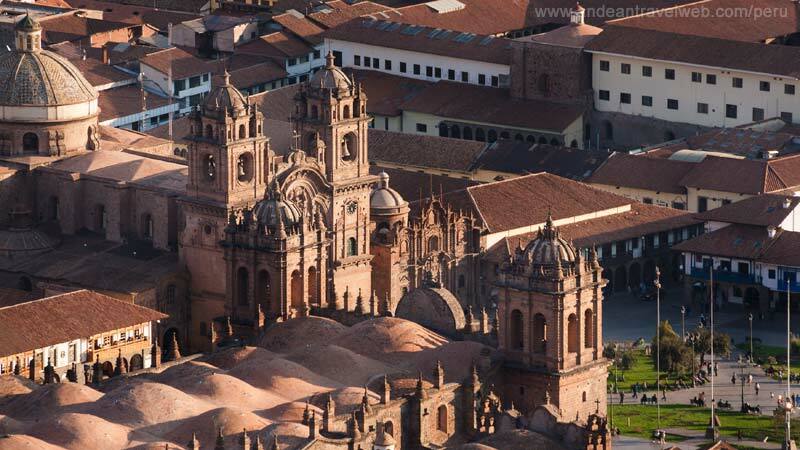 El Triunfo is on the right hand side of the Cathedral and was the first Christian church in Cusco. It was built on the site of Suntur Huasi (the Roundhouse), the main Inca armoury where the Spanish were trapped during Manco Inca's siege in 1536. When the Incas burned the city the thatched roof of Suntur Huasi caught fire, but then mysteriously went out. The Spanish later broke out and recaptured Sacsayhuaman, ending the siege. Before long the "miracle" had grown into a vision of the Virgin Mary extinguishing the flames, accompanied by Saint James (Santiago) on horseback, streading terror among the natives. The church was built to commemorate this victory and the miracle. La Compania de Jesus church is located on the south-east side of the Plaza de Armas and rivals the Cathedral in grandeur and prominence. The original structure was built in the 1570's by the Jesuits on the site of Inca Huayna Capac's palace, known as Amaru Cancha or Palace of the Serpents and was said to be the most beautiful of all the Inca palaces). Huayna Capac was the last Inca to rule over an undivided, unconquered empire. The first church was destroyed in the earthquake of 1650. The present day building was finally completed 18 years later in 1668. The most impressive feature of La Compania is the incredible baroque facade with two majestic bell towers. The interior is cool and a little gloomy apart from a stunning gilded altar-piece which is often lit up at night. The church also posses several important works of art from the Cusquena School. On the right hand side of the church is the Lourdes Chapel which is now used as an exhibition centre to display local paintings and handicrafts. Plaza Nazarenas is a pretty little square just 1 block from the main Plaza de Armas in Cusco. To get there just follow the cobbled street to the left of the main Cathedral (standing in the Plaza de Armas looking at the Cathedral in front of you, its the street to the left heading uphill) As you go up the street you will pass the Museo Inka on your left, which is well worth a visit. Plaza Nazarenas is surrounded by some of the best and most exclusive hotels in Cusco. As you enter Plaza Nazarenas you have the 5-star Inkaterra La Casona on your left. On the far side of the Plaza and to the left you have the 5-star Belmond Palacio Nazarenas and just next door and to the right you can find the 5-star Belmond Monasterio Hotel. Both Palacio Nazarenas and the Monasterio both have excellent restaurants set in beautiful colonial courtyards and open to non-residents, check out the Restauarant Senzo (Palacio Nararenas) & Restaurant Illariy (Monasterio) respectively. On the far left of the Plaza Nazarenas (as you enter from the Plaza de Armas) you can find the Museo de Arte Pre-Colombino (the Pre-Colombian Art Museum). If you are like me and don't know your history "Pre-Colombian" means any Peruvian history relating to the time before Chrisopher Colombus discovered the Americas. i.e. the Incas and cultures before them. I know you knew that, but just in case.. This is an excellent museum and if you are planning on visiting any museum whilst in Cusco I would recommend the Museo de Arte Pre-Colombino first, narrowly followed by the Museo Inka and then maybe by the Museo Machu Picchu. Unfortunately none of these museums are included on the Boleto Turistico so you'll have to pay an extra entrance fee (but well worth it and much better than the free museums included on the Boleto Turisto which are enough to put you off visiting museums for life). Located in one of the interior patios of the Museo de Arte Pre-Colombino you can find the stunning MAP cafe. It's not a cafe but a stylish top quality restaurant. Looking like a glass cube this intimate restaurant serves modern Peruvian cuisine. Hatun Rumiyoc ("the Street of the Great Stone" in Quechua) is a narrow pedestrianized alley which runs to the north of the palace of Inca Roca, the sixth Inca. (follow Calle Triunfo to the right of the Cathedral and just keep going straight on). The massive Inca wall of the palace is well preserved and contains the famous 12-angled stone which is located about halfway along the wall. The stone is famous for its size and incredible workmanship since it fits perfectly with its neighboring stone blocks. The 12-angled stone can also be seen on every bottle of Cusqueña beer!! Cuesta San Blas is the name given to the narrow cobbled street that runs from the end of Calle Hutun Rumiyoc uphill to the Plazoleta de San Blas. This is the gateway to the San Blas district famous for its narrow streets and alleyways filled with handicraft shops, artisan workshops, boutique hotels and little restaurants and bars. Cuesta San Blas is the perfect introduction to this district and is lined with some lovely handicraft shops selling local ceramics and paintings. Its a steep little climb so if you've just arrived in Cusco you will certainly start to feel the effects of the altitude on your heart - try to take it easy and take plenty of rests. At the bottom of Cuesta San Blas, on the corner with Calle Choquechaca you'll find Jack's Cafe. This is a very popular place and often there'll be a queue of tourists outside waiting to get a table. You can get a great full-English breakfast here, fresh juices, a highly recommended chicken and vegetable soup plus loads of other delicious dishes. About a third of the way up the road on the left you can find Granja Heidi (Heidi's Farm) which offers fresh, nutritious meals as well as a good selection of vegetarian meals including delicious stuffed peppers. The San Blas district is located on a hill to the northeast of the Plaza de Armas. The area is known as Cusco's artisans' quarter since many of the best craftsmen have their workshops and small art galleries in the cobbled, narrow streets surrounding the 16th-century church of San Blas. Craftsmen include Hilario Mendivil, Santiago Rojas, Maximiliana Palomino & Edilberto Merida. It is believed that this area was also the artists' district even during the Inca times, with the streets filled with the best gold- and silver-smiths, potters, painters and carvers from throughout the Inca empire. San Blas really comes to life in the evenings when the bars and restaurants open. 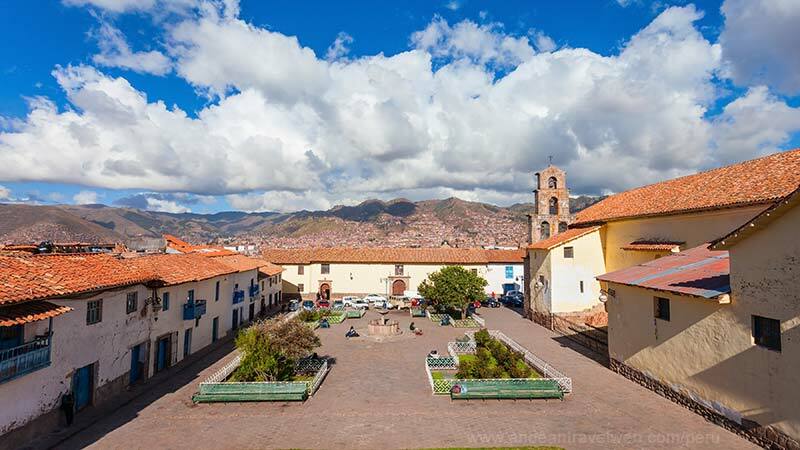 The area above the fountain to the northeast of the plaza is a good place to take advantage of the view out over Cusco and the red tiled rooftops. On Saturdays there is a handicraft market in the square. San Blas church, founded in 1562, is of simple adobe construction but it contains an extraordinary wood pulpit carved from a single massive tree-trunk. At the top stands Saint Paul, his foot resting on a human skull, believed to belong to the craftsman who made the pulpit.